Opinion: A Pen That Sums Up Japanese Pens? I really want to get a Japanese pen, but I honestly have no idea where to start! What I'd love is to know what you guys and girls think is a pen that is a good example of a Japanese pen? I would be looking to spend somewhere in the region of $80-120 max. USD? Maybe one of the Sailor Pro Gear Slim Shiki-Oriori Four Seasons pens. Edited by plumo, 13 July 2017 - 00:57. The Pilot Custom 74 is quite typical of a great many Japanese pens. Edited by Bluey, 13 July 2017 - 00:58. Mediterranean blue, Asa Goa, China blue, Royal blue, Sapphire blue, Indigo, Washable Blue....the colours of the rainbow. Edited by plumo, 13 July 2017 - 01:00. If you like black cigars, get a Pilot Custom or a Sailor Profit/ProfessionalGear or a Platinum 3776 Century. 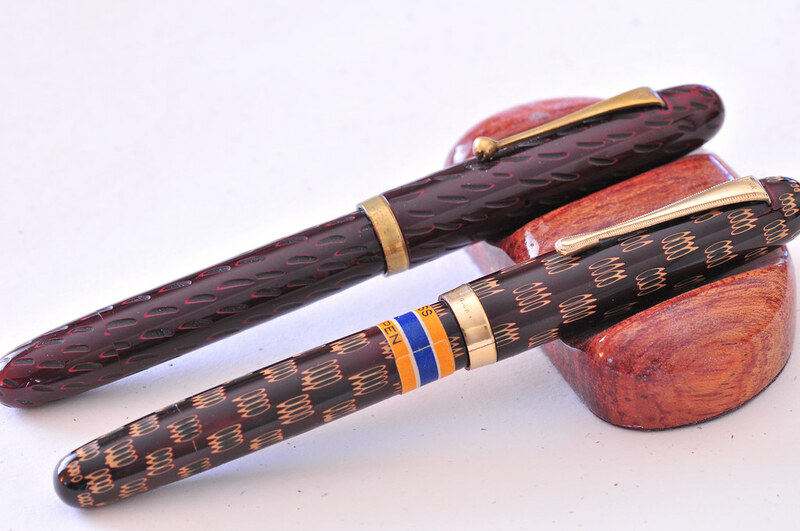 Start with looking at the homepages and buy a pen of the 3 famous pen makers Pilot/Sailor/Platinum. They also have other colours or designs. Ah, how could I overlook this: a Sailor pen with an extra fine nib. Within stated budget (from Japan): Platinum #3776 - choice of colours, soft nib option and the slip/seal cap. Any pen that puts so much effort into not drying out is a plus in this country! if you want a fine nib, go with pilot custom 74 in fine. platinum and sailor tend to have a little more feedback. It's the other way around. And before that the Sheaffer Balance. Edited by Bluey, 13 July 2017 - 01:53. Pre-war Japanese eyedropper in a Kamakuri-bori pattern. Edited by AltecGreen, 13 July 2017 - 03:09.
a bit over the budget, don't you think so? What sort of nib should I be looking at for a Japanese 'feel'? Obviously a F/EF, are the softer nibs a Japanese style, or a western add on? The soft nibs are very much designed for Eastern scripts, so they can't be used for Western calligraphy as they'll railroad quickly. The soft nibs that are available in your price range are soft fine, soft fine-medium, and soft medium. The nib width that you should be looking for is whatever you're most comfortable with. Edited by Bluey, 13 July 2017 - 04:00. I understood the soft nib to be useful for writing Japanese characters. Happy to be corrected. My Platinum #3776 SF certainly feels like my most special nib. Hard to describe, but It feels gentle or delicate as the nib touches the paper. I have one in ultra extra fine that was the result of an impulsive ebay bid - it feels very Japanese too. Suitable for very tiny characters, or in my case, tiny cross-hatching. I like both, but I don't think the UEF will get used nearly as much as the soft fine simply because it's more specialised.